- Page 18 - Vista Casas Real Estate S.L. Vista Casas are excited to offer this new build development of 25 Quad-type Villas located in the up and coming area of Pau 26 in Villamartin. These 3 bedrooms, 3 bathrooms properties have use of a communal pool, and some plots offering space for a private pools. Be the first to secure one of these fantastic new houses at the release price! Residential Muna Spa Resort is a complex of new luxury apartments situated in the sought after Los Dolses area, walking distance to all amenities including Villamartin Plaza and Golf and the Zenia Boulevard. The project consists of 78 apartments with high quality finishes, 2 and 3 bedrooms, 2 bathrooms. 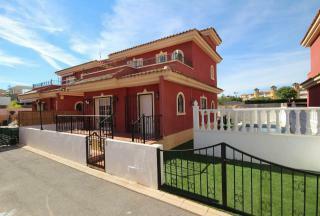 (Reduced from 219,000euro) A beautiful 3 bedrooms, 3 bathrooms detached villa located in Rioja in Villamartin. Positioned between Los Dolses and La Fuente this property is ideally located in relation to local amenities. With all 3 bedrooms located on the lower level leaving a large lounge and south facing garden perfect for relaxing in. 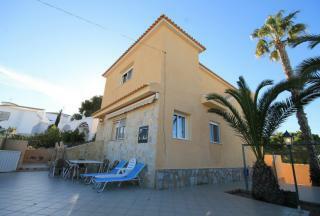 This recently refurbished 3 bedrooms, 2 bathrooms semi-detached property is located in the popular area of Los Dolses. 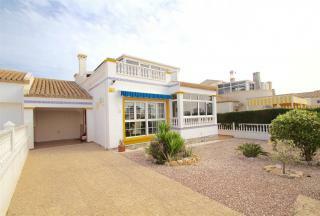 Walking distance to local amenities including La Zenia Boulevard and beach. The property includes its own private pool with good sized bedrooms and living space. Viewings highly recommended. This is a unique 3 bedrooms, 2 bathroom detached villa with very spacious accommodation throughout.. 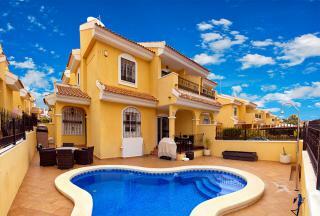 The villa also has a separate apartment on the lower ground floor. There is off road parking and a garage to the rear. 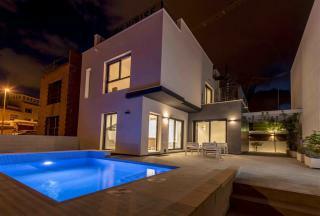 Outside the 400m2 plot has established gardens and plenty of room for a private pool. The villa also benefits from air conditioning, replacement double glazing, mains gas central heating and is to be sold furnished. Reserve early to benefit from the low release price of only 225.000 euro for these high quality 3 bedrooms, 2 bathrooms detached villas including, driveway parking and private roof solarium of 33m2, Private Pool, White Goods. 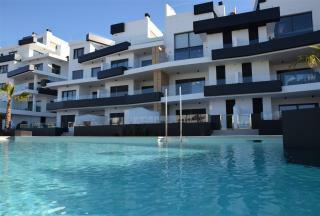 Situated in Villamartin and only a short drive to the Golf Course and famous Villamartin Plaza, the coast and the beaches. (Reduced by 15,000 euro) Located in the popular residential area of Los Dolses, Villamartin you will find this superb southwest facing 107m2 Detached Villa. The property occupies a generous 350m2 plot with Garage, storage room and 233m2 garden. The Villa distributes over two floors with 35m2 roof solarium. The ground floor offers a spacious lounge and dining area (originally the 3rd bedroom), fully equipped Kitchen, a double bedroom and a bathroom. The 16m2 front terrace has been created into a conservatory. To the first floor there is the master bedroom with ensuite and balcony leading to the roof solarium, part of which has been closed in to create a winter garden. The community has a large pool and gardens. 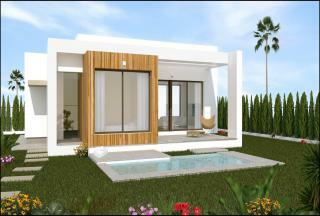 Single level new build villa located within a Golf Resort, situated between Los Montesinos and San Miguel de Salinas. This property offers 3 bedrooms and 2 bathrooms with good outdoor space. Located just minutes walk to local amenities, a 15 minute drive to the coast and 40 minutes to Alicante Airport.